AGAIN I am soo sorry for not blogging for such a long time AGAIN! Right after I said I'd be posting in a few days. Well, it's been a month. I promise to do at least one blog post a week from now on. Let's see how far I get with that. 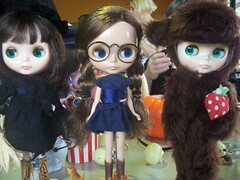 This is a blog post I should have done ages ago about Christmas and the blythe meet. Ok. Well I went to the WPWD Christmas meet ages ago and it was awesomely fun! 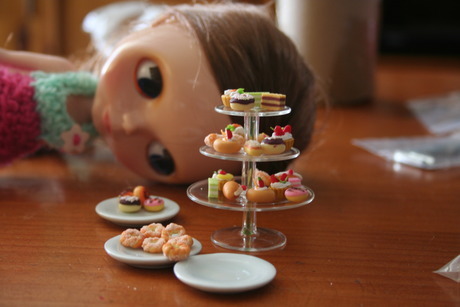 I learnt how to make my very own lps/polly pocket hybrid. It is a polly pocket body with a lps head, and her name is Honey. I got the books, the wool and fabric I got before Christmas and I got some re-ment too!! 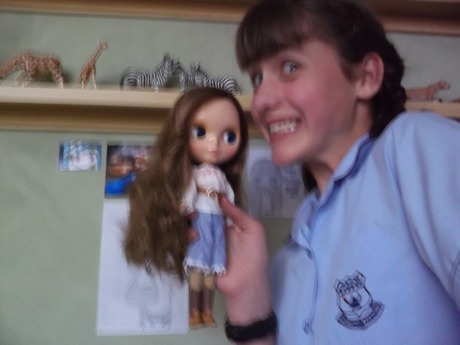 This is Scarlett with the re-ment, which is awesomely awesome. 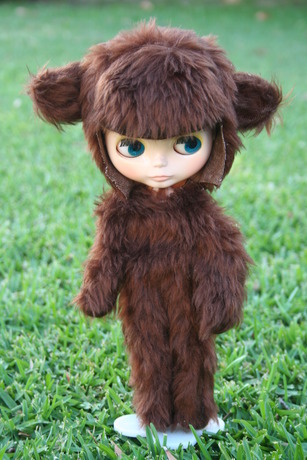 I didn't get another blythe doll, but's getting exactly what you want is not what Christmas is about! I did get some other awesome things including tickets to the Harry Potter Exhibition in Sydney (which I have already been to but I am SOO happy to be going to again, as it was really really awesome) some jewellery, gift cards and lots of other things. I hope you all had a great Christmas and New Year. What did you get for Christmas and was it really fun? Again, I'm so sorry about my lousy blogging. I am SO sorry I have not blog posted for AGES and AGES. I have been really busy at school and other things. But I am doing a post now!! But onto some happier things, you may or may not know that I completely LOVE Harry Potter. Well, there is an exhibiton here in Australia at the moment of heaps and heaps of the movie props and things in it. About a week ago I went with my friend on the train down the the powerhouse museum to see it!! It was SOOO awesome! If you would like to read about the Harry Potter Exhibition, or buy tickets, go here. 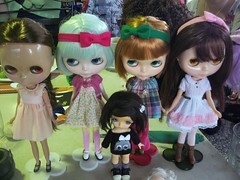 Tomorrow I am going to a Christmas blythe meet and me and my dolls are SO excited!! I should post about that in a few days. There is going to be a Christmas swap too!! It is going to be so much fun!! That is a painting I did a few weeks ago. 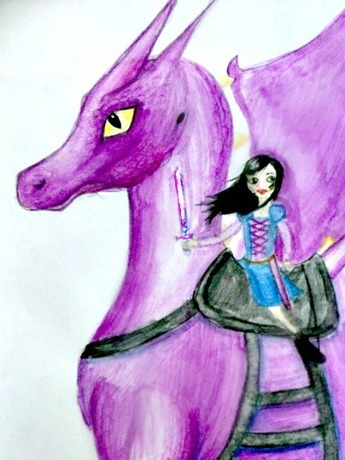 It is a purple dragon and a girl with a sword. 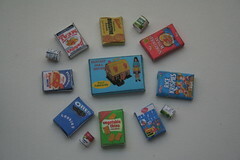 well a while ago I made these AWESOME mini boxes that are printables from Dr blythenstein on flickr. I also made these printable re ment things from HERE. For more photos please visit my flickr. If you have a go at making one of these things please email me a picture at cady.neville@live.com.au!! I would love to see them! 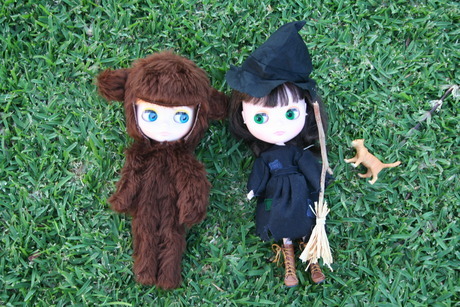 Well if you have been reading my posts I have said that I am going to a blythe halloween meet. Well last week I did and it was soo fun!! 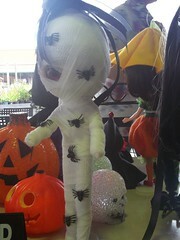 There were so many awesome dolls there in beautful halloween costumes, and their mums were amazing people who were all really kind. 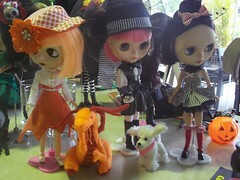 As you can see, there were some wonderfully amazing dolls there!! 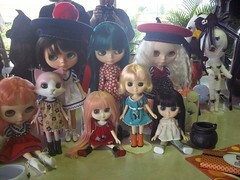 My blythes and I made lots of new friends!! Here is Evie with her long lost twin Audrey, who's mummys blog is HERE. Get a blybe doll (cheap copy of blythe dolls that are quite dodgy but good to practice customising on) and customise her so I can practice customisation before I get a simply peppermint and give her the same hair as the one in the picture, and also customise her and sand matte her, etc. I think she is SOOOO pretty! 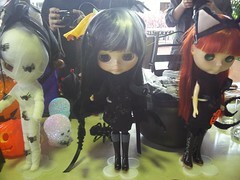 The blythe meet was my first ever one and it was sooo fun and lovely to meet lots of lovely people who love blythe dolls too!! And there is another Christmas one coming up! I can't wait!! Thank you for reading my blog!! Please post a comment if you would like to. 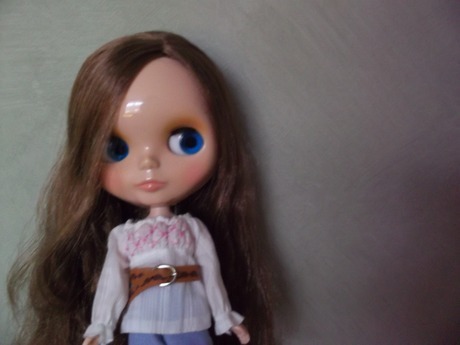 As you may know, I was saving up for my third blythe doll, Urban Cowgirl. Well, I BOUGHT HER!! And a few days ago she arrived!! I love her SOOO much and I decided to call her Scarlett, I think that name really suits her. I'm sorry that the pictures aren't as good quality as they usually are, my mum bought me my very own new camera because my old one stopped working ages ago and I just used hers but now she got me another one. It is blue and water-proof. Yay! 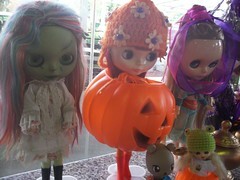 Evie, Daphne, Scarlett and I are all really excited about the HALLOWEEN BLYTHE MEET ON SUNDAY!! 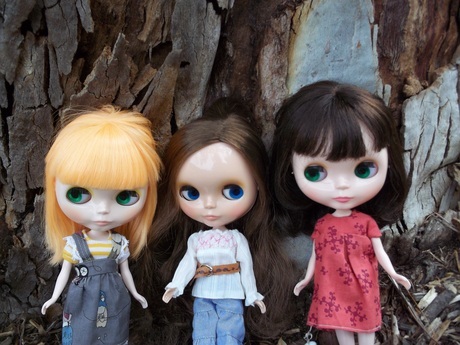 It is our first blythe meet and we are really looking forward to meeting awesome people who love blythe dolls (like I said in my last post). YAAAAYY!! 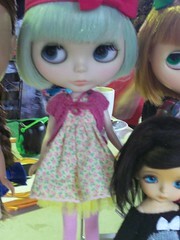 I hope to get more blythe dolls in the future. The next one I would like is either Nostalgic pop or Friendly Freckles. I asked for either of them for Christmas. 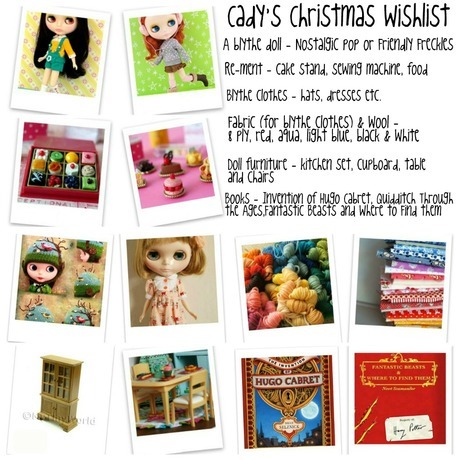 Here is my Christmas wishlist, although I need to cross off re-ment because I already got some! YAAYY!! Thanks SO MUCH for reading my blog!! Remember to leave a comment if you would like to!! This post is about a few things. 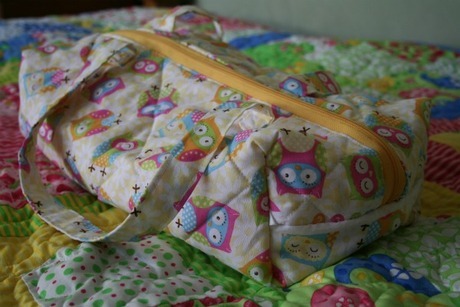 Firstly, I am finally telling you what I got from Marley from winning a competition on her blog!! 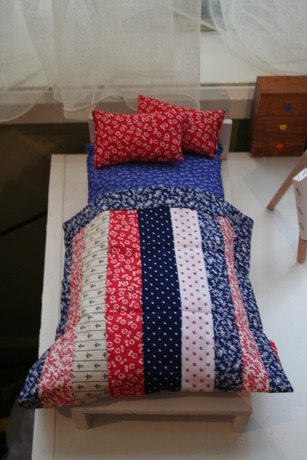 Well, I got this AWESOME blythe doll quilt and two cute little pillows! Thanks SO SO much Marley I love everything so so so much and so do Evie, Daphne and I'm sure my Urban cowgirl (still un-named, in the mail on the way to my house) is going to love it too. Aaannd, I bought lots of awesome re-ment things!! 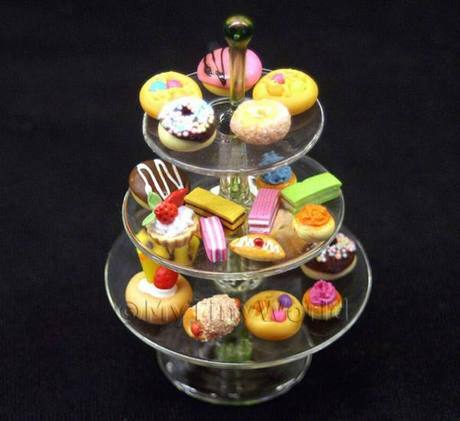 Like this 3 tier cupcake stand with all that yummy-ness included! Teehee!! 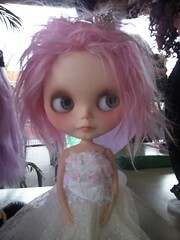 I am really excited about the meet next week as I have never been to a blythe meet before and I am looking forward (a lot) to meeting people who love blythe!!! Thanks for reading my blog and please leave a comment!! p.s. come back soon for a post about what I got from awesome Marlie for winning a competition on her blog and also about some awesome blythe things I made!! I am really sorry but I a not making any more blog signatures!! I have made quite a few and I am really sorry if you missed out but that is OK if you did because when I get my etsy store I might be selling them for a teeny tiny price. 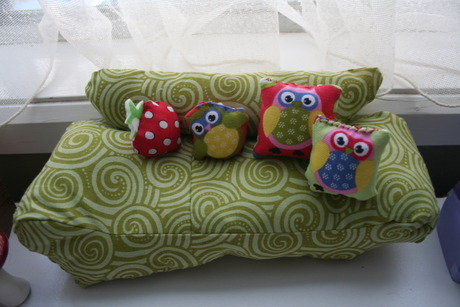 They do take some work and if you buy one you would be suporting me. I am so sorry!! p.s. I bought my Urban Cowgirl yesterday!!! Do you know what I should call her? Please comment if you have any ideas!! Thanks!! 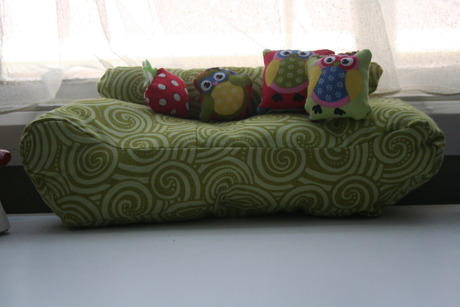 Today I am FINALLy posting about my day at Emily's!! I went there last Tuesday and it was SO SO fun!! 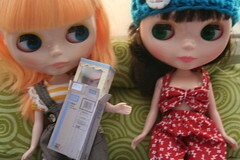 I took Evie and Daphne so they could meet Emily's, Jasper's (Emily's brother's) and Janelle's (Emily's mum's) blythe dolls!! 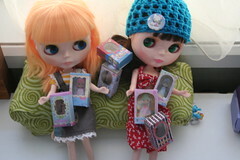 ...and Emily gave me not one but TWO of her mum's awesome awesome blythe dresses, TWO amazing crochet beanies and TWO epic miniature Frankie magazines for my blythe dolls to read!!! 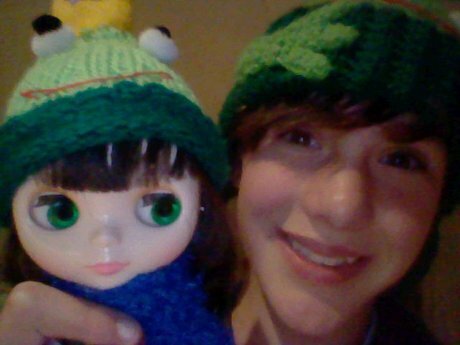 Emily made the beanies and magazines. Thank-you SO SO much Emily!! 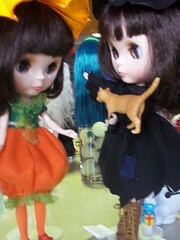 When I got there we went to Sunnyside, this little museum thingy where we took some awesome photos of our blythe dolls. Then we did some drawing, and GUESS WHAT!? I got to do a drawing for blythiful magazine!!! 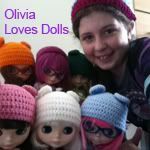 It is a magazine that will be printed soon and it is all about blythe and other awesome dolls!! Go HERE to find out more. It's so exciting!! After that we had yummy haystacks for lunch!! We also made two stopmotions that you can see HERE if you scroll down a little, one about our two Simply Mangos seeing each other and fainting because they are identical and then becoming friends and the other about Ivy (Jasper's blythe doll) cooking a pie/cake for Evie and Elsie (Emily's blythe doll). Emily was also extremely awesome and taught me how to crochet! Thank you so much for doing that Emily! I have been crocheting some things but I will do a separate post about that another day. Thanks soooooooo much Emily, I had such an AWESOME day, it was really really fun!! 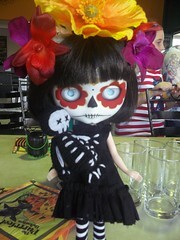 Madeline is having a giveaway where you can win an awesome rainbow blythe headband! !